Halong Bay’s climate is humid and tropical. With a hot, humid summer and dry, cold winter; its temperature varies from 15ºC to 25ºC. Ha Long bay has typical diurnal tide system (tide amplitude ranges from 3.5-4m). The salinity is from 31 to 34.5MT in dry season and lower in rainy season. It is possible to visit Ha Long Bay year-round, with the best time to visit from October through April, although during the winter months of December, January and February, the weather in Halong Bay can be cool and overcast with low visibility. During the summer months from May to September, temperatures rise and storms are more likely during the rainy season.Book your trip with huonghaisealifecruise.com and you'll get the best advices. March April + May: Temperature: ~ 20°C-22°C; Some days have light rain; Clear with blue sky. June + July + Aug: Temperature: ~ 26°C-28°C with strong Sun; Carefully with Typhoon; Some days have trong but quick rain. Sept + Oct + Nov: Best time to enjoy Halong with cool temperature: ~ 26°C-28°C. Dec + Jan + Feb: Temperature: 18°C~20°C; Cold with strong wind; Some days are misty and rainy. 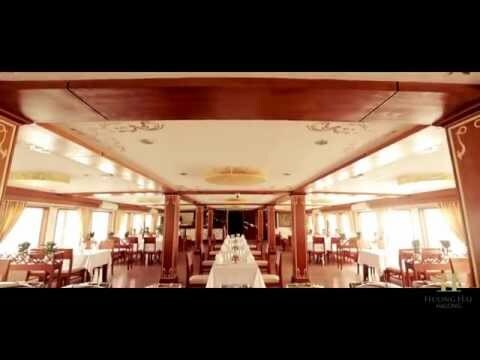 Halong bay cruise "sleep" in landfall days in Quang Ninh. According to Infonet, to August 1st the Northen province including Quang Ninh weather sometimes has sunlights. People in some areas have come back home, started remedial cleanup after the flood, but the ahead situation still has numerous challenges. More than 1,000 travelers were stranded at the Co To island have also taken to the mainland. According to 31st July Quang Ninh Newspaper, Provincial People's Commitees (PPC) has organized of online meeting with localities to implement supporting for households whose homes were destroyed by heavy rains and flooding. Also at the meeting, as reported by the representative of Fatherland Front Committee of Quang Ninh province, to the present time has 190 units and individuals registered to support disaster recovery totaling of over 54 billion. After listening to the localities proposals for supporting for each type of object damage, Mr. Vu Thi Thu Thuy- PPC Deputy Chairman - has unified , for building newly "collapsed completely" houses will be supported up to 50 million / home; "repairly destructive" houses to 20 million / home. For flooded homes, from 1 meter or higher, will be supported to 5 million / home. Supporting for 2 million / month for 1 house who must rent new place, apply within 3 months. * Haiphong is the second local improvisation influenced by recent heavy rains. To August 1st, some of Cat Hai commnues still remain isolated and the most heavily destroy was in Viet Hai commune. According to VTC News, Viet Hai commune located in a valley as a huge basin between Biosphere Reserve World Cat Ba (Cat Hai, Hai Phong). Also, because of flooding from upstream down, the water level in the Thuong river was rising. The effect of rainfall, to August 1st, many roads in the Bac Giang City (Bac Giang province) have deeply covered in water. Many motor vehicles, motorcycles must find another way to go due to flooding at average of 50-60 cm high. High risk of landslides in provinces in northern mountainous areas (especially Quang Ninh, Ha Giang, Tuyen Quang, Lao Cai, Yen Bai, Phu Tho, Lai Chau, Dien Bien, Son La, Hoa Binh) and flooding in low-lying areas, along riversside and streams; urban flooding, especially Quang Ninh, Hai Phong, Thai Binh, Nam Dinh. What is the Halong bay weather like today ? Whether does it got enough wind for sailing to explore Bai Tu Long bay or not? And "What to wear today?" is the main topic discussion. The weather in Summer in Ha Long Bay is usually from 25 - 35 degree Celsius but the humidity is relatively high. Addition that, it also has the sea wind, the air is quite comfortable, not too hot and muggy as in the city center. You want to have a great sea voyage so you need to prepare a lot of things. But what is most important & indispensable, see TOP 7 items bring for your beach vacation listed below.